Once upon a time, a fair maiden met and married her long-time love. They had many children, lived in a beautiful home and enjoyed all of life’s offerings. One day as this mother, wife, lover of life, walked past a mirror, she caught a glimpse of herself and wondered, “Who is that ‘old woman”?” After this rude jolt, she realized that her former beauty had begun to fade. What was happening to the face she had grown to love? How and when did the sagging begin? Was it blatantly apparent to everyone but her? Was there a way to find prettiness again? What were her options to regain a shapely, sculptured face? Sadly, this “fairy tale” is repeated many times a day. The graying of America is a fact; while the Baby Boomers are turning 60, many men and women are endlessly searching for anti-aging solutions. They seek the latest and greatest remedy, choosing lotions and potions promising a “scientific breakthrough” just hoping that something will stop the tired, old look they are portraying. These aging boomers and zoomers want to look as young as they feel; rather they’re faced with thinning hair, bodies that have become misshapen and faces that are less recognizable. Certainly there are options. Pick up any magazine or newspaper, get online and you’ll see plenty of compelling ads for plastic surgery, injections and treatments aimed at helping one look younger. Even if some or all of these methods are tried, the fact remains that aging gracefully is more than just “nips and tucks”. Frankly, it’s an inside job that starts with “the man in the mirror” and this is where the magic begins. Face work in front of mirror is practiced by many models, singers, speakers and actors as they hone their craft for the audience and the camera. At first, you, like others, may feel uneasy as you steadily peer at yourself for a period of time; however, the mirror can be very revealing of who you really are and how you look to the world at large. Here’s how “Mirror Work” begins: Be alone. Close the door and move close to the mirror so you can intimately examine your face. Observe how you smile. Keep your face relaxed. How do you appear? Do you look angry or sad? Are your mouth corners down-turned? Can you determine what’s changed in your appearance? Can you say “I love you and I forgive you” to that reflection looking back at you? Talking out loud to your mirror can subtly begin altering who you are, how you think about yourself and how much you can love yourself. Facial exercise is one of the easiest ways to incorporate “Mirror Work” into a daily routine. That’s right, exercise for your face is just as important as exercise for your body. When you are exercising your face on a regular basis, you are constantly observing your face in the mirror while you execute the movements to ensure that your finger and thumb placements are accurate. As you spend more time gazing at your features, a certain type of acceptance begins to take hold in your psyche. Maybe you will begin to notice that you are more accepting of yourself and others, that little annoyances are indeed trivial and that you are becoming more becoming. 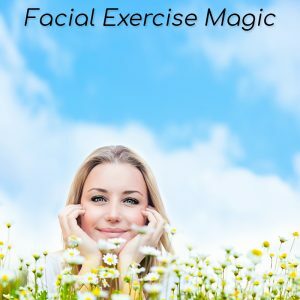 Yes, the magic of facial exercise works from the inside out, first making an important shift in the shape and contour of the muscles supporting your skin, but most importantly, there is magic when you shift your thinking to acceptance, love and peace of mind. There is magic as you understand that both physical and emotional change is possible. Like the song says, “If you want to make the world a better place, take a look at yourself and make a change”.